Wheeee! I'm shamelessly flashing five poems in the spring issue HiNgE Online (Volume 7, Issue 1: April/May 2006). Coffee House Poetry (Issue 9, May 2006): I'm very pleased with the eclectic tastes of this UK-based magazine. It's 72 pages, 4 x 6 (approx. ), perfect-bound with matte color card cover. Poets in this issue include some familiar names: Deb Baker, Christopher Barnes, Jim Bennett, John G. Hall, Nigel Humphreys, Idore, Anthony James, Mike Keating, Craig Kirchner, Neil McCarthy, Ashok Niyogi and Alison White. Bruce Ackerley gets the featured poet role while I get the mini-feature. Anon (Issue 4): Purrrr! Fabulous poetry published here, at least the kind that strokes me right. They have an interesting anonymous submission procedure, hence the magazine's name. It's 95 pages, 3 x 5 (approx. ), perfect-bound with matte photographic card cover. Poets include AC Bevan, Rod Burns, Robert Etty, Rob MacKenzie, Oliver Murray, Dean Wilson and yours truly. Orbis (#136): Because of the 2nd place award in the previous issue, I asked for a three-issue subscription instead of cash. Poets in this issue include Tony Curtis. Ian Davidson, Gillian Clark, Nigel Humphreys, Mike Jenkins and Sheenagh Pugh (of whose book, The Beautiful Lie I am a devotee). Special thanks to Sharon for showing me this link. oh and once i have stopped giggling hysterically, no, er, wait, i mean shivering frantically, or ... um, well, whatever, then i will congratulate you on all the publications. i actually discovered you in hinge this morning. i still have not heard back from them. 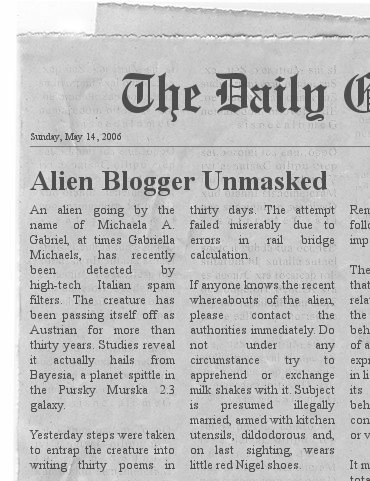 perhaps they mistook me for the alien? i think i might go and ask my kitchen utensils if they have seen that shameless alien. i think it goes by the name of gjnjel, my word verification is usually right about such things. teeheehee. i can't believe you're denying you're not a bayesian spam. the nerve of it! in the public, too. i have contacted the x files you know and sent them all your childhood pictures. hopefully, no one will mistake you for nigel... whose shoe size and preferences you seem to share. and, teehee, for someone who claims not to remember him anymore, you sure remember more than i do. ahem. for one, he never allowed me to smell his little feet. by the way, hinge replies after two months. how long has it been since you sent? angela, will you please stop comparing me to that creep? so what if we have the same shoe size? i also have the same shoe size as three of the most intelligent people on the planet. so there. hinge: it's been 2 months. pretty much exactly 2 months. yrtszx. nowhere on earth do y's, x's, and z's occur more often than in word verifications. Congratulations Arlene!! You totally rock! Whoopeeedoo, I've cut my hair!